Metro is a basic element of modern Public Transport system of the Tyne and Wear Conurbation. It was designed and built based on existing in the first half of the 19th century freight and passenger railroads. The development potential of this system is exhausted. To meet the needs of transport services to residents of the Tyne and Wear Conurbation creation of a new system of high-speed off-street traffic. One version of such the system is “THE NORTHUMBERLAND – TYNE & WEAR – DURHAM METRO (as the result of the Tyne and Wear Metro Development” (by Gleb K.Samoilov, July, 2011) – Sources: http://www.skyscrapercity.com/showthread.php?p=82175232 , http://trainclub.ru/view_blog/perspektivy_razvitiya_seti_tyne_wear_metro_velikobritaniya/ , http://www.amazines.com/article_detail.cfm?articleid=3328638 , http://commons.wikimedia.org/wiki/File:The_Tyne_and_Wear_Metro_Development_Conception_-_July,_2011_(by_Gleb_K.Samoilov).jpg , http://www.skyscrapercity.com/showthread.php?t=402998&page=88 , http://commons.wikimedia.org/wiki/File:The_Northumberland_-_Tyne_%26_Wear_-_Durham_Metro_as_the_result_of_the_Tyne_%26_Wear_Metro_Development.jpg A detailed exposition of the Concept presented in the Book: Samoilov G.K. THE TYNE AND WEAR METRO DEVELOPED NETWORK AS THE BASIS OF THE URBAN TRANSPORT INTEGRATED SYSTEM. – Newcastle-upon-Tyne, Almaty: EUROPOLIS Project Department, 2012. – 256 p.: figures. - ISBN 978-601-06-1769-8 http://archive.org/details/TheTyneAndWearMetroDevelopedNetworkAsTheBasisOfTheUrbanTransport , http://ia701200.us.archive.org/21/items/TheTyneAndWearMetroDevelopedNetworkAsTheBasisOfTheUrbanTransport/SamoilovG-TheTyneAndWearMetroDevelopedNetwork.pdf , http://openlibrary.org/books/OL25399334M/THE_TYNE_AND_WEAR_METRO_DEVELOPED_NETWORK_AS_THE_BASIS_OF_THE_URBAN_TRANSPORT_INTEGRATED_SYSTEM ; http://www.scribd.com/doc/103217898/Samoilov-G-K-THE-TYNE-AND-WEAR-METRO-DEVELOPED-NETWORK-AS-THE-BASIS-OF-THE-URBAN-TRANSPORT-INTEGRATED-SYSTEM ; http://www.docstoc.com/docs/127409865/THE-TYNE-AND-WEAR-METRO-DEVELOPED-NETWORK--AS-THE-BASIS-OF-THE-URBAN-TRANSPORT-INTEGRATED-SYSTEM--by-Gleb-KSamoilov ; and in the Brochure: Samoilov G.K. 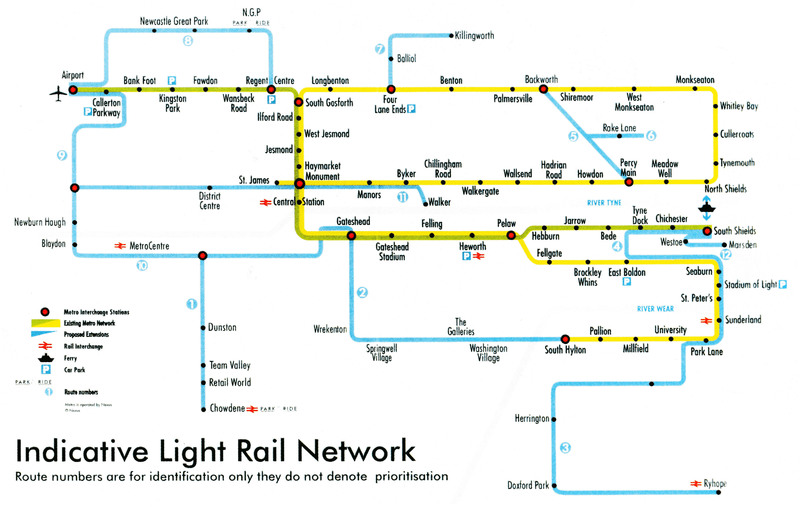 THE TYNE AND WEAR METRO DEVELOPMENT PROPOSAL – 2011. – Newcastle-upon-Tyne, 2011. – 55 p.: figures. http://ntl.bts.gov/lib/43000/43600/43655/The_TYNE_and_WEAR_METRO_Development_Proposal_-_2011.pdf , http://www.scribd.com/doc/103219808/Gleb-K-Samoilov-The-TYNE-and-WEAR-METRO-Development-Proposal-2011 . Creating such a system requires a thorough discussion of all the details of the project. In this respect interesting to trace the Development of modern ideas to improve Metro of Tyne and Wear. One of the first proposals for the development of the network Metro was “THE PLANNED TYNESIDE METRO LINE, 1969”. The Source: http://alternatehistory.com/discussion/showthread.php?p=5025262 . “The new TTB would run the new line as a metro service through the centre of the city once it opens – something planned for 1969”: Ponteland (the Initial station / the Final station of the Route) – Callerton Parkway – Bank Foot – Kingston Park – Fawdon – Wansbeck Road – Regent Centre – South Gosforth – Ilford Road – West Jesmond – Jesmond – Haymarket – Monument – Central Station (the Hub) – Gateshead – Gateshead Stadium – Felling – Heworth (the Hub) – Pelaw – Wardley – Sulgrave – Barmston – Fatfield – Harraton – Barley Mow – South Pelaw (the Initial station / the Final station of the Route – the Hub). The Branch from South Gosforth to Longbenton – Four Lane Ends – Benton – Forest Hill (the Initial station / the Final station of the Route – the Hub). The Branch from Pelaw to Hebburn – Jarrow – Bede – Tyne Dock – Chichester – South Shields (the Initial station / the Final station of the Route). Very interesting suggestions for tracing lines are given in “PUBLIC TRANSPORT ON TYNESIDE – A PLAN FOR THE PEOPLE” (Published in 1973). The Source: http://www.skyscrapercity.com/showthread.php?t=402998&page=65 . The diagram of the “POSSIBLE EXTENSION TO THE RAPID TRANSIT SYSTEM” shows: - Lines of the “1979 R.T. system” – from Kenton Grange through South Gosforth, Gateshead, Hebburn and Tyne Dock to South Shields; from Saint James through Byker, North Shields and Benton to South Gosforth. - Branches of the “Possible extension to R.T. system” – from Kenton Grange to Airport; from Benton to Killingworth; from Saint James to Denton Burn; from Byker to Hebburn; from Gateshead through Team Valley to Kibblesworth; from Gateshead through Washington, Southwick and Sunderland to Doxford Park; from Tyne Dock through East Boldon to Southwick. - the Branch of the “Possible improved R.T. alignment” – from Hebburn to Tyne Dock. - the Branch of the “Possible application of future technology” – from North Shields to South Shields. Metro lines under construction intensively. Various stages of construction of fixed schemes: “The evolution of the METRO MAP, from 1969 to the present day”. The Source: http://www.skyscrapercity.com/showthread.php?t=402998&page=32 . The Publication Author’s comments: “1 - 1969 (Pre-system opening) the original Tyneside PTE proposed route, from "Rapid Transit for Tyneside" published by Tyneside PTE.” “2 - 1971 (still pre-opening) and the 'diagramatic' map first appears. NOTE, the station called 'Osborne', in between West Jesmond and Jesmond stations.” “3 - 10th August 1980, the Metro opens and its first public-use map shows that only the 'Haymarket to Tynemouth' (Yellow Line) stretch is open.” “4 - April 1981, the 'Haymarket to Bank Foot' stretch (Green Line) opens.” “5 - October 1981, The Metro bridge opens (Royal opening on 6th November) and the lines extend through Monument (for the first time) and on to Heworth. The 'Red Line' for peak day-time journies, is also added to the map.” “6 - 1982, the riverside part of the Yellow Line from Tynemouth, through the second level at Monument, to St James' opens.” “7 - 1982, the Green Line is extended from Heworth to South Shields, and the second 'peak day-time' line (the Blue Line) between St James' and North Shields, is added to the map.” “8 - 1985, Kingston Park and Pelaw stations are added and a 'mark' for the future Palmersville station, can be seen on the map.” “9 - 17th November 1991, the line to Newcastle Airport opens and is added to the map, on the Green Line.” “10 - The extension to Sunderland opens, and the map changes considerably. The 'sloping line' of the South Gosforth to Gateshead stretch is straightened, the two 'peak time' lines (Red & Blue lines) are gone, and the yellow line now diverts off at Pelaw, down to South Hylton.” The set of diagrams is corrected and updated. Sources: http://www.skyscrapercity.com/showthread.php?t=402998&page=33 – 'Early 2000' – “Here is the Metro Map of that period, showing the Sunderland extension (The 'South Hylton Line' to be more correct) when it was under construction …” (by “Newcastle Historian”, “Skyscrapercity.com” Moderator and Archivist. – November, 14, 2009): http://www.traintesting.com/images/metromaplarge.gif ; http://www.skyscrapercity.com/showthread.php?t=402998&page=86 – The Sunderland Extension - 2002: Sunderland – South Hylton (by “gleconsam”, “Skyscrapercity.com” Registered User. – September, 12, 2011). In the early 1990s appears Project “SUNDERLAND METRO EXTENSION” (by “Steer Davies Gleave”, 1991): http://www.whatdotheyknow.com/request/27819/response/71314/attach/2/Pelaw%20Victoria%20Viaduct.pdf . Interesting options 5, 6, 7, 8, 9 and 10: -	“OPTION 5 – Metro operation. PELAW – VICTORIA VIADUCT via Leamside Line. VICTORIA VIADUCT – SUNDERLAND” (Base Option, Variant 1, Variant 2, Variant 3) – 15 (7 for Metro Converted BR Line + 8 for New Metro Operation) new stations. -	“OPTION 6 – Metro / LRT operation. METRO: PELAW – A1290 via Leamside line. LRT: WASHINGTON – A1290 – SUNDERLAND” (Base Option, Variants) – 19 (5 for New Metro Operation + 14 for New LRT Operation) new stations. -	“OPTION 7. METRO: PELAW – A1290 via Leamside Line. LRT: ECML INTERCHANGE – WASHINGTON – A1290 – SUNDERLAND” (Base Option, Variant 1) – 25 (4 for Metro Converted BR Line + 21 for New LRT Operation) new stations. -	“OPTION 8 – LRT operation. GATESHEAD STADIUM – DURHAM ROAD – WASHINGTON A1231 – SUNDERLAND” (Base Option, Variant 1, Variant 2) – 27 new stations. Alternative Routes: Mount Pleasant – Birtley; Southwick – Sunderland. -	“OPTION 9 – LRT Operation. METRO CENTRE – GATESHEAD INTERCHANGE – DURHAM ROAD – WASHINGTON – A1231 – SUNDERLAND” (Base Option, Variants) – 28 new stations . -	“OPTION 10 – Metro Operation. PELAW – WASHINGTON via Leamside Line” (Base Option) – 8 (4 for New Metro Operation + 4 for Metro Converted BR Line) new stations. THE PARTIAL INTEGRATION OF THE TYNE AND WEAR METRO WITH THE SEGMENT OF REGIONAL RAILWAY LANE (Route Map for the Metro; Mid-1990s). The Source: http://newcastleupontyne.tripod.com/metro.html ; http://www.skyscrapercity.com/showthread.php?p=83763085 ; http://www.italymagpies.it/Metro.jpg . The Metro Green line: Airport – Callerton Parkway (Car Parking) – Bank Foot (Car Parking) – Kingston Park (Car Parking) – Fawdon – Wansbeck Road – Regent Centre (Car Parking) – SOUTH GOSFORTH – Ilford Road – West Jesmond – Jesmond – Haymarket – MONUMENT – CENTRAL STATION – Gateshead – Gateshead Stadium – Felling – HEWORTH (Car Parking) – Pelaw – Hebburn – Jarrow (Car Parking) – Bede – Tyne Dock – Chichester – South Shields. The Metro Yellow line: Saint James – MOMUMENT – Manors – Byker – Chillingham Road – Walkergate (Car Parking) – Wallsend – Hadrian Road – Howdon – Percy Main – Meadow Well – North Shields – Tynemouth (Car Parking) – Cullercoats – Whitley Bay (Car Parking) – Monkseaton – West Monkseaton – Shiremoor (Car Parking) – Palmersville – Benton (Car Parking) – Four Lane Ends (Car Parking) – Longbenton – SOUTH GOSFORTH – Ilford Road – West Jesmond – Jesmond – Haymarket – MONUMENT – CENTRAL STATION – Gateshead – Gateshead Stadium – Felling – HEWORTH (Car Parking) – Pelaw. The British Rail: Sunderland – Seaham – East Boldon – Brockley Whins – HEWORTH (Car Parking) – (Walker New Bridge over River Tyne or Walker New Tunnel under River Tyne) – CENTRAL STATION – (The King Edward VII railway Bridge over River Tyne) – Metro Centre – to Hexham and Carlisle. In 1997, it is assumed that by 2002 the Sunderland Metro line will be extended from South Hylton to Washington (4 stations) – “TYNE & WEAR METRO IN 2002”. – TDC, 1997 / Simon Bone, 1999. Sources: http://www.skyscrapercity.com/showthread.php?t=140635&page=4 , http://www.projectmapping.co.uk/Reviews/Resources/Newcastle%20Metro%202002.gif . The Publication Author’s comments: “Pelaw – South Hylton (Green Line) extension, four additional stations (Backworth, Beaconsfield are approved; High Lane Row, Simonside are planned), further Washington extension mentioned by Nexus”. In the late 1990s and early 2000s developed the concept of an integrated public transport system. The basis of this system is Metro. It is developed by building new landlines of Segregated Bus, Tram, Superoute and Rail Development. One of the options is “INDICATIVE LIGHT RAIL NETWORK” (Newcastle Metro proposals. Modern Railways April 2002). The Source: http://www.projectmapping.co.uk/Reviews/Resources/Newcastle%20metro%20(MR%20402).jpg . The existing Metro lines are not changed. Between Palmersville station and Shiremoor station build the new station BACKWORTH (now it is “Northumberland Park” Metro station). At stations AIRPORT, REGENT CENTRE, FOUR LANE ENDS, PERCY MAIN, MONUMENT, GATESHEAD, SOUTH SHIELDS, SOUTH HYLTON interchange nodes are organized for new lines of “The Light Rail Network”. These lines form twelve routes. Proposed Extensions Route 1: Chowdene (the New station – the Initial station / the Final station of the Route – the Existing Rail Interchange node), Retail Word (the New station), Team Valley (the New station), Dunston (the New station), The Metro Centre (the New station – the Initial station / the Final station of the Route – the Existing Rail Interchange node / the Light Rail Interchange node). Proposed Extensions Route 2: South Hylton (the Existing Metro station / the New Light Rail station – the Initial station / the Final station of the Route – the Metro / the Light Rail Interchange node), Washington Village (the New station), The Galleries (the New station), Sprigwell Village (the New station), Wrekenton, (the New station), Gateshead (the Existing Metro station / the New Light Rail station – the Metro / the Light Rail Interchange node – the Initial station / the Final station of the Route 2 – the Initial station / the Final station of the Route 10). Proposed Extensions Route 3: Ryhope (the New station – the Initial station / the Final station of the Route – the Existing Rail Interchange node), Doxford Park (the New station), Herrington (the New station), Park Lane (the Existing Metro station / the New Light Rail station), Sunderland (the Existing Metro station / the New Light Rail station – the Initial station / the Final station of the Route 3 – the Initial station / the Final station of the Route 4 – the Existing Rail Interchange node). Proposed Extensions Route 4: Sunderland (the Existing Metro station / New the Light Rail station – the Initial station / the Final station of the Route 4 – the Initial station / the Final station of the Route 3 – the Existing Rail Interchange node), Saint Peter's (the Existing Metro station / the New Light Rail station), Stadium of Light (the Existing Metro station / the New Light Rail station), Seaburn (the Existing Metro station / the New Light Rail station), East Boldon (the Existing Metro station / the New Light Rail station), Tyne Dock (the Existing Metro station / the New Light Rail station), Chichester (the Existing Metro station / the New Light Rail station), South Shields (the Existing Metro station / the New Light Rail station – the Initial station / the Final station of the Route 4 – the Initial station / the Final station of the Route 12 – the Existing Ferry Interchange node). Proposed Extensions Route 5: Percy Main (the Existing Metro station / the New Light Rail station – the Metro / the Light Rail Interchange node – the Initial station / the Final station of the Route), Backworth (the New Metro station / the New Light Rail station – the Metro / the Light Rail Interchange node – the Initial station / the Final station of the Route). Proposed Extensions Route 6: The Branch of the Route 5 at the Rake Lane station (the New station – the Initial station / the Final station of the Route). Proposed Extensions Route 7: Four Lane Ends (the Existing Metro station / the New Light Rail station – the Metro / the Light Rail Interchange node – the Initial station / the Final station of the Route), Balliol (the New station), Killingworth (the New station – the Initial station / the Final station of the Route). Proposed Extensions Route 8: Airport (the Existing Metro station / the New Light Rail station – the Initial station / the Final station of the Route 8 – the Initial station / the Final station of the Route 9 – the Metro / the Light Rail Interchange node), three stations in the Newcastle Great Park area (new stations), Regent Centre (the Existing Metro station / the New Light Rail station – the Initial station / the Final station of the Route – the Metro / the Light Rail Interchange node). Proposed Extensions Route 9: Airport (the Existing Metro station / the New Light Rail station – the Initial station / the Final station of the Route 9 – the Initial station / the Final station of the Route 8 – the Metro / the Light Rail Interchange node), Callerton Parkway (the Existing Metro station / the New Light Rail station), Throckley (the New station – the Light Rail Interchange node – the Initial station / the Final station of the Route 9 – the Initial station / the Final station of the Route 10 – the Initial station / the Final station of the Route 11). Proposed Extensions Route 10: Throckley (the New station – the Light Rail Interchange node – the Initial station / the Final station of the Route 10 – the Initial station / the Final station of the Route 11 – the Initial station / the Final station of the Route 9), Newburn Hough (the New station), Blaydon (the New station), The Metro Centre (the New station – the Initial station / the Final station of the Route 1 – the Existing Rail Interchange node / the Light Rail Interchange node), Gateshead (the Existing Metro station / the New Light Rail station – the Metro / the Light Rail Interchange node – the Initial station / the Final station of the Route 10 – the Initial station / the Final station of the Route 2). Proposed Extensions Route 11: Throckley (the New station – the Light Rail Interchange node – the Initial station / the Final station of the Route 11 – the Initial station / the Final station of the Route 9 – the Initial station / the Final station of the Route 10), The District Centre (the New station), Saint James (the Existing Metro station / the New Light Rail station), Monument (the Existing Metro station / the New Light Rail station – the Metro / the Light Rail Interchange node), Manors (the Existing Metro station / the New Light Rail station), Byker (the Existing Metro station / the New Light Rail station), Walker (the New station – the Initial station / the Final station of the Route). Proposed Extensions Route 12: South Shields (the Existing Metro station / the Light Rail station – the Initial station / the Final station of the Route 12 – the Initial station / the Final station of the Route 4 – the Existing Ferry Interchange node), Westoe (the New station), Marsden (the New station – the Initial station / the Final station of the Route). 2003 – PROJECT ORPHEUS. – Options for Corridors Considered Unsuitable as Metro Extensions During Phase 1A of Project Orpheus. Final Report / by Nexus / Consultants: Steer Davies Gleave; Jacobs GIBB. – May, 2003. – 20 p. The Source: http://www.whatdotheyknow.com/request/27819/response/71153/attach/3/Options%20for%20-non%20LRT%20routes%20to%20end%20of%20Phase%201A%20May%2029%202003.pdf . “The Superoute Network – Phase 1” – this is a coordinated system of bus lines and metro lines. “Purpose-built transport interchange”: Regent Centre, NEWCASTLE CENTRAL STATION, Wallsend, North Shields, Gateshead, Heworth, South Shields, SUNDERLAND STATION. “Possible interchange between Bus and Metro”: Monkseaton, Whitley Bay, Cullercoats, Tynemouth, Meadow Well, Walkergate, Chillingham Road, Byker, Gateshead Stadium, Felling, Seaburn, University. The Initial stop / the Final stop of Bus routes: Blyth, Cramlington, Whitley Bay Seafront, Metro Centre, South Shields, Silksworth, Doxford International Business Park, South Hetton, Durham, Darlington, Bishop Auckland. Ordinary Bus stops: -	Dudley, Seaton Burn, Wideopen, Brunton Park, Great North Road; -	Cowgate, Blakelaw, Newbigginn Hall Estate; -	Rosenhill, High Howdon, Chirton, West Chirton, New York, North Tyneside Hospital, Cullercoats Seafront, Marden Estate; -	Bensham, Lobley Hill, Whickham, Grange Estate, Saltwrell Park, Coatsworth Road; -	Low Fell, Birtley, Barley Mow, Chester-le-Street, Fence Houses, Houghton-le-Spring, Hall Lane Estate, East Rainton; -	Queen Elizabeth Hospital, Beacon Lough, Wrekenton, Springwell Estate, Whitehills Estate, Leam Lane Estate, High Lanes, Colegate; -	Lingey Lane, Concord, Albany, Washington Galleries, Fatfield, Newbottle, Hetton-le-Hole, Easington Lane; -	Westoe, Harton Nook, Cleadon, Fulwell Grange, Monkwearmouth, Silksworth; -	Sunderland Royal Hospital, Pennywell, Barnes Park, East Herrington. 2003 – Project Orpheus. Building on success. – Project Orpheus. Phase 1A. Summary Report / by Nexus / Consultants: Ernst &Young LLP; Steer Davies Gleave; JacobsGIBB. – May, 2003. – 14 p. The Source: http://www.whatdotheyknow.com/request/27819/response/71153/attach/2/Final%20Phase%201A%20report%2011%20June%202003%202.pdf . “Schematic Map showing the Ten Corridors going through to Phase 1B Analysis” – “ORPHEUS ROUTES” The Tram Route 1: Sunderland (the Existing Metro station – the Initial station / the Final station of the Route – the Existing Rail Interchange node), Ryhope (the New station – the Existing Rail Interchange node), Seaham (the New station – the Initial station / the Final station of the Route). The Tram Route 2: Sunderland (the Existing Metro station – the Initial station / the Final station of the Route – the Existing Rail Interchange node), Park Lane (the Existing Metro station – the New Interchange node), Doxford Park (the New station), Ryhope (the New station – the Initial station / the Final station of the Route – the Existing Rail Interchange node). The Tram Route 6: Pallion (the Existing Metro station – the Initial station / the Final station of the Route – the New Interchange node), Washington (the New station), Wrekenton (the New station – the Initial station / the Final station of the Route – the New Interchange node). The Tram Route 8: Wrekenton (the New station – the Initial station / the Final station of the Route – the New Interchange node), RING, Gateshead (the Existing Metro station – the Initial station / the Final station of the Route – the New Interchange node). The Tram Route 9: Team Valley (the New station – the Initial station / the Final station of the Route), Teams (the New station – the Initial station / the Final station of the Route – the New Interchange node). The Tram Route 12: South Shields (the Existing Metro station – the Initial station / the Final station of the Route – the Existing Ferry Interchange node), Chichester (the Existing Metro station – the New Interchange node), Tyne Dock (the Existing Metro station – the New Interchange node), East Boldon (the Existing Metro station – the New Interchange node), Seaburn (the Existing Metro station – the New Interchange node), Stadium of Light (the Existing Metro station – the New Interchange node), Saint Peter’s (the Existing Metro station – the New Interchange node), Sunderland (the Existing Metro station – the Initial station / the Final station of the Route – the Existing Rail Interchange node). The Tram Route 19: Gateshead (the Existing Metro station – the Initial station / the Final station of the Route – the New Interchange node), Teams (the New station – the New Interchange node), MetroCentre (the New station – the Initial station / the Final station of the Route – the Existing Rail Interchange node). The Tram Route 21a: Denton (the New station – the New Interchange node – the Initial station / the Final station of the Route), Walbottle (the New station – the Initial station / the Final station of the Route). The Tram Route 21b: MetroCentre (the New station – the Initial station / the Final station of the Route – the Existing Rail Interchange node), Denton (the New station – the New Interchange node – the Initial station / the Final station of the Route). The Tram Route 21: Denton (the New station – the Initial station / the Final station of the Route – the New Interchange node), District Centre (the New station), Saint James (the Existing Metro station – the New Interchange node), Monument (the Existing Metro station – the New Interchange node – the Initial station / the Final station of the Route). The Tram Route 23: Four Lane Ends (the Existing Metro station – the Initial station / the Final station of the Route – the New Interchange node), Killingworth (the New station), Cramlington (the New station – the Initial station / the Final station of the Route). The Tram Route 28: Monument (the Existing Metro station – the New Interchange node – the Initial station / the Final station of the Route), Manors (the Existing Metro station – the New Interchange node), Byker (the Existing Metro station – the New Interchange node), Walker (the New station – the Initial station / the Final station of the Route). All routes are provided for the “Orpheus Concept”, shown in Scheme “PROJECT ORPHEUS CORRIDOR RECOMMENDATIONS”. Sources: http://www.skyscrapercity.com/showthread.php?t=402998&page=56 ; http://82.39.246.179/photos/Nexus_Orpheus_2010.png . EXISTING METRO LINES (60 stations with 7 Metro Interchange Stations: Monument, South Gosforth, Four Lane Ends, Percy Main, Gateshead, Pelaw and South Shields). TRAM LANES (routes 1, 2, 9, 12, 19, 21, 21a, 21b, 23 and 28): *the Route 1 – Sunderland (the Existing Metro station – the Initial station / the Final station of the Route – the Existing Rail Interchange node), Ryhope (the New station – the Existing Rail Interchange node), Seaham (the New station – the Initial station / the Final station of the Route). *the Route 2 – Sunderland (the Existing Metro station – the Initial station / the Final station of the Route – the Existing Rail Interchange node), Park Lane (the Existing Metro station – the New Interchange node), Barnes Park (the New station), Doxford Park (the New station), Tunstall (the New station), Ryhope (the New station – the Initial station / the Final station of the Route – the Existing Rail Interchange node). *the Route 9 – Team Valley (the New station – the Initial station / the Final station of the Route), Bensham (the New station), Teams (the New station – the Initial station / the Final station of the Route – the New Interchange node). *the Route 12 – South Shields (the Existing Metro station – the Initial station / the Final station of the Route – the Existing Ferry Interchange node), Chichester (the Existing Metro station – the New Interchange node), Tyne Dock (the Existing Metro station – the New Interchange node), East Boldon (the Existing Metro station – the New Interchange node), Seaburn (the Existing Metro station – the New Interchange node), Stadium of Light (the Existing Metro station – the New Interchange node), Saint Peter’s (the Existing Metro station – the New Interchange node), Sunderland (the Existing Metro station – the Initial station / the Final station of the Route – the Existing Rail Interchange node). *the Route 19 – Gateshead (the Existing Metro station – the Initial station / the Final station of the Route – the New Interchange node), Teams (the New station – the New Interchange node), MetroCentre (the New station – the Initial station / the Final station of the Route – the Existing Rail Interchange node). *the Route 21 – Denton (the New station – the Initial station / the Final station of the Route – the New Interchange node), District Centre (the New station), Saint James (the Existing Metro station – the New Interchange node), Monument (the Existing Metro station – the New Interchange node – the Initial station / the Final station of the Route). *the Route 21a – Denton (the New station – the New Interchange node – the Initial station / the Final station of the Route), Walbottle (the New station – the Interchange node – the Initial station / the Final station of the Route). *the Route 21b – MetroCentre (the New station – the Initial station / the Final station of the Route – the Existing Rail Interchange node), Denton (the New station – the New Interchange node – the Initial station / the Final station of the Route). *the Route 23 – Four Lane Ends (the Existing Metro station – the Initial station / the Final station of the Route – the New Interchange node), Killingworth (the New station – the Interchange node), Cramlington (the New station – the Initial station / the Final station of the Route). *the Route 28 – Monument (the Existing Metro station – the New Interchange node – the Initial station / the Final station of the Route), Manors (the Existing Metro station – the New Interchange node), Byker (the Existing Metro station – the New Interchange node), Walker (the New station – the Initial station / the Final station of the Route). SEGREGATED BUS LANES (routes 6, 8, 10, 15, 22 and 26): *the Route 6 – Pallion (the Existing Metro station – the Initial station / the Final station of the Route – the New Interchange node), Town End Farm (the New station – the Interchange node), East Washington (the New station – the Initial station / the Final station of the Route – the New Interchange node). *the Route 8 – Gateshead (the Existing Metro station – the Initial station / the Final station of the Route – the New Interchange node), Queen Elisabeth Hospital (the New station), Washington Town Centre (the New station – the Initial station / the Final station of the Route – the New Interchange node). *the Route 10 – Heworth (the Existing Metro station – the Initial station / the Final station of the Route – the New Interchange node), East Washington (the New station – the Interchange node), Washington Town Centre (the New station – the Initial station / the Final station of the Route – the New Interchange node). *the Route 15 – Tyne Dock (the Existing Metro station – the Initial station / the Final station of the Route – the New Interchange node), Brockley Whins (the Existing Metro station – the New Interchange node), Town End Farm (the New station – the Initial station / the Final station of the Route – the Interchange node). *the Route 22 – Airport (the Existing Metro station – the Initial station / the Final station of the Route – the New Interchange node), Great North Park (the New station), Regent Centre (the Existing Metro station – the Initial station / the Final station of the Route – the New Interchange node). *the Route 26 – Backworth / Northumberland Park (the Existing Metro station – the Initial station / the Final station of the Route – the New Interchange node), West Chirton (the New station – the New Interchange node), Percy Main (the Existing Metro station – the New Interchange node), Port (the New station – the Initial station / the Final station of the Route – the Existing Ferry Interchange node). SUPEROUTE LANES (routes 3, 4, 7, 11, 14, 16, 17, 20, 24, 27 and 29): *the Route 3 – Seaham (the New station – the Initial station / the Final station of the Route – the New Interchange node), Murton (the New station), Hetton-le-Hole (the New station), Houghton-le-Spring (the New station), Doxford Park (the New station – the Initial station / the Final station of the Route – the New Interchange node). *the Route 4 – Doxford Park (the New station – the Initial station / the Final station of the Route – the New Interchange node), Biddick (the New station – the Initial station / the Final station of the Route – the New Interchange node). *the Route 7 – Chester-le-Street (the New station – the Initial station / the Final station of the Route), Biddick (the New station – the New Interchange node), Washington Town Centre (the New station – the Initial station / the Final station of the Route – the New Interchange node). *the Route 11 – Washington Town Centre (the New station – the Initial station / the Final station of the Route – the New Interchange node), Heworth (the Existing Metro station – the Initial station / the Final station of the Route – the New Interchange node). *the Route 14 (the Ring) – South Shields (the Existing Metro station – the Initial station / the Final station of the Route – the New Interchange node – Existing Ferry Interchange node), Chichester (the Existing Metro station – the New Interchange node), Harton (the New station), Marsden (the New station), South Shields (the Existing Metro station – the Initial station / the Final station of the Route – the New Interchange node – Existing Ferry Interchange node). *the Route 16 – Stanley (the New station – the Initial station / the Final station of the Route), Sunniside (the New station), Whickham (the New station), MetroCentre (the Existing Rail station – the Initial station / the Final station of the Route – the New Interchange node). *the Route 17 – Consett (the New station – the Initial station / the Final station of the Route), Rowlands Gill (the New station), Swalwell (the New station), Blaydon (the New station – the Initial station / the Final station of the Route – the New Interchange node). *the Route 20 – Airport (the Existing Metro station – the Initial station / the Final station of the Route – the New Interchange node), Walbottle (the New station – the New Interchange node), Blaydon (the New station – the New Interchange node), MetroCentre (the New station – the New Interchange node), Teams (the New station – the New Interchange node), Gateshead (the Existing Metro station – the Initial station / the Final station of the Route – the New Interchange node). *the Route 24 – Airport (the Existing Metro station – the Initial station / the Final station of the Route – the New Interchange node), Great Northern Park (the New station – the New Interchange node), Gosforth Park (the New station), Killingworth (the New station – the Initial station / the Final station of the Route – the New Interchange node), Backworth / Northumberland Park (the Existing Metro station – the Initial station / the Final station of the Route – the New Interchange node). *the Route 27 – Monument (the Existing Metro station – the Initial station / the Final station of the Route – the New Interchange node), Haymarket (the Existing Metro station – the New Interchange node), Heaton (the New station – the New Interchange node), West Chirton (the New station – the New Interchange node), Billy Mill (the New station), Whitley Bay (the Existing Metro station – the Initial station / the Final station of the Route – the New Interchange node). *the Route 29 – Four Lane Ends (the Existing Metro station – the Initial station / the Final station of the Route – the New Interchange node), Heaton (the New station – the New Interchange node), Byker (the Existing Metro station – the Initial station / the Final station of the Route – the New Interchange node). RAIL DEVELOPMENT LANES (routes 5, 18 and 25): *the Route 5 – South Hylton (the Existing Metro station – the Initial station / the Final station of the Route – the New Interchange node), Leamside Lane (Possible connection). *the Route 18 – Central Station (the Existing Metro station – the Existing Rail station – the Initial station / the Final station of the Route – the New Interchange node), MetroCentre (the Existing Rail station – the New Interchange node), Prudhoe (the New station – the Initial station / the Final station of the Route). *the Route 25 – Backworth / Northumberland Park (the Existing Metro station – the Initial station / the Final station of the Route – the New Interchange node), Newsham (the Existing Rail station), Badlington Station (the Existing Rail station), Ashington (the Existing Rail station). In the mid-2000s Further Development is assumed as follows: http://www.all-science-fair-projects.com/science_fair_projects_encyclopedia/Image:TandWMetro.png . The Publication Author’s comments: “Yellow, Green - existing Metro lines run by Nexus. Black - Tyne passenger ferry run by Nexus. Dark grey - proposed extensions on existing rail lines. Light grey - proposed extensions requiring new track. […] In 2002 Nexus unveiled Project Orpheus, an expansion plan that would extend the Metro system by adding new sections using street running, thus changing the nature of the Metro to a supertram-like system. […] The plan listed a number of routes, not all of which were to be built as rail lines; transitional bus services were envisioned that could be replaced by trams as demand increased. […] Another project, to remove the last section of single track in the Metro system, between Pelaw and Bede, […] would allow freight trains to use the Metro infrastructure […]. Among extensions proposed at various times: Washington, either via the disused Leamside Line or a new route […]; Blyth & Ashington, running on existing little-used freight lines […]; Tyne Dock to East Boldon along a dismantled railway alignment could easily be added, as only a short distance lies between two Metro lines […]; Killingworth and Cramlington have been planned since Metro was on the drawing board, but would require widening of the busy East Coast main line to four tracks, which would be expensive; Newcastle's west end would require entirely new track involving tunneling and bridging in hilly terrain […]; Ryhope, in southern Sunderland, has been mooted as an extension using existing railway lines. Project Orpheus also went to Ryhope, but using a different route”. Gradually, the activity of new proposals has decreased, and the debate about the directions of further development of the Tyne and Wear Metro stop. Periodically appearing publications on the history of the Metro is not of great interest to the Public. Renewed interest in the topic of Metro is already in the second half of the 2000s. New ideas are once again attracting Public attention to the problem of Public Transport improving: http://www.amazines.com/article_detail.cfm/3432477?articleid=3432477&title=Tyne%2Cand%2CWear%2CMetro%2CUrban%2Crapid%2Ctransit%2Csystem%2CPublic%2CTransport .